Director – Robert Zemeckis, Screenplay – Bob Gale, Story – Bob Gale & Robert Zemeckis, Producers – Bob Gale & Neil Canton, Photography – Dean Cundey, Music – Alan Silvestri, Visual Effects – Industrial Light and Magic (Supervisors – Scott Farrar & Ken Ralston), Special Effects Supervisor – Michael Lantieri, Production Design – Rick Carter. Production Company – Amblin/Universal. In 1955, Marty McFly receives a telegraph message left for him by Doc Brown telling him that Doc has been thrown back in time to 1885 after being hit by a lightning bolt. Marty obtains the aid of the 1955 Doc to head back in time in the DeLorean to rescue the 1985 Doc. From the records in 1955, he discovers that Doc was killed in 1885 by Biff’s outlaw ancestor Mad Dog Tannen. Marty successfully returns to 1885 but the car is damaged and he is unable to return. There he finds that Doc has fallen for Clara Clayton, a schoolteacher from 1885. Now Marty has to not only to find a means to save Doc from Mad Dog, but also a way of getting the damaged DeLorean up to 88 miles-per-hour using only the primitive technology of the time in order to return to the present day. Back to the Future Part III was the final entry in the trilogy begun with Back to the Future (1985). Part III was shot back-to-back with its predecessor Back to the Future Part II (1989) and both were released six months apart. Despite the enormous hit of the first film, neither sequel was the blockbuster that they were expected to be. The expected hip cross-cultural wit and clever plot complicities sustained by the two preceding entries are all there in Back to the Future Part III. Although, in comparison to the previous two films, Back to the Future Part III comes across as lighter – especially after the dazzling conceptual juggling and the darkly oppressive middle of the second entry – otherwise it is a slickly made and rousingly entertaining effort. The only part it seems to fail in is its junk-culture margin pastiches – the joke with Michael J. Fox calling himself Clint Eastwood gets overdone. (Although, there is that nice moment where Marty first mentions the name to a puzzled Doc in 1955 and the camera pans away to a billboard advertising a double-bill of Tarantula (1955) and Revenge of the Creature (1955) – two films in which a young Clint Eastwood had bit parts – and Michael J. Fox shrugs “I guess he isn’t so well known yet”). Christopher Lloyd does a nice job of opening out the character of Doc. He and Mary Steenburgen (in her second cross-time love story, after Time After Time (1979) and playing just as daffily as she did there) have a charm together with their mutual rhapsodies over Jules Verne. 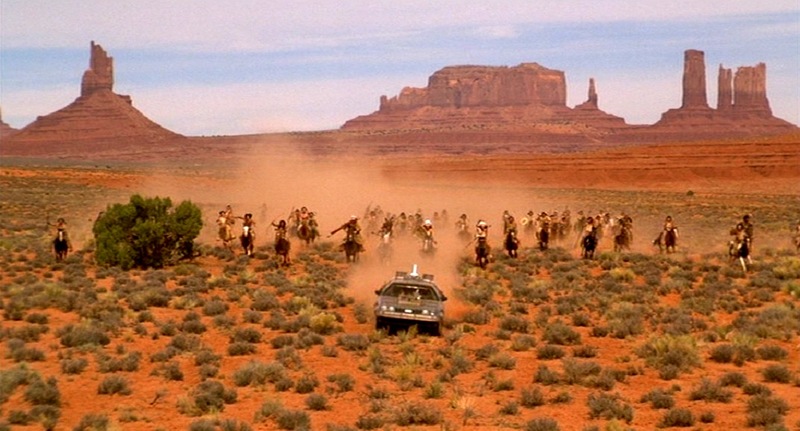 The film’s setting is clearly intended to allow director Robert Zemeckis to have fun with various Western cliches – he quotes Sergio Leone and Eastwood. A commendable attempt is made to approximate the historical realism of the period – showing animal turds in the streets and the bad hygiene of the time.